Carter Fort joins Rosscott, Alex Heberling, and Mark Savary for this edition of the Webcomic Beacon Newscast! We also have newshound Eric (Exiern) to thank for snooping out stories! 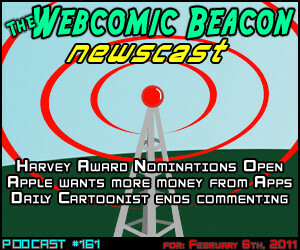 Yet another Webcomic Readers rears it’s head, striping out website contest to show just the comic. Yet more discussion on Digital Manga Distribution. 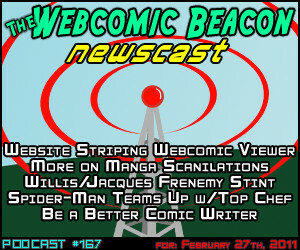 Plus a lot of tid-bits todayincluding references for getting started with comic creation, Spider-Man teaming up with Top Chef, and Jeph Jacques/Dave Willis frenemy situation with Penny and Aggie-gate! Correction: This isn’t an App (as we may have stated), but a browser script. Is it too late for for even free translated manga to prosper? 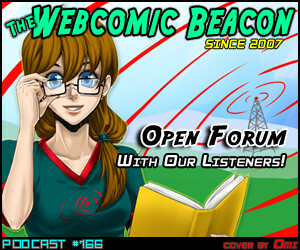 Several of our listeners join Fes and Tanya to discuss their webcomics! Had to reschedule the scheduled topic, and at the last minute we made an impromtu Open Forum episode! One of the benefits of listening to us LIVE as we record, are chances such as this! I also incorrectly stated it was episode 167. I was wrong. That’s the next episode! Remember that (most of) The Webcomic Beacon will be at Penguicon! 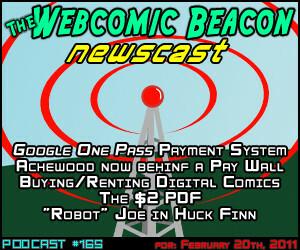 Eric Kimball leads Mark Savary and Fes in this edition of the Webcomic Beacon Newscast! A Mexican Susih house stole the T-shirt design of the Alison Action (bearnutscomic.com) photoshoped out the severed human head and arms and used it as a mascot without permission. The Gigcast Podcast Returns! …again! …maybe? Adam Smithee, Alex Heberling, and Fes Works are here to discuss Adaptation Distillation vs Adaptation Decay. We talk a bit about the Uncanny Valley, Muppet Babies, Starship Troopers, Hitchhiker’s Guide to the Galaxy, Transformers, Cowboys and Aliens, and a few other series. Kara Dennison joins Rosscott, Mark Savary, and Fes are here for you in this edition of the Webcomic Beacon Newscast! We also have newshound Eric (Exiern) to thank for snooping out stories, who was also on today’s show! Neil Giaman discusses how piracy of his work increased his sales. 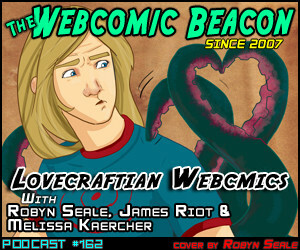 Robyn Seale (The Watcher of Yaathagggu), James Riot (The Path), and Melissa Kaercher (The Geek Life) join Fes and Mark to discuss H. P. Lovecraft and his short stories, and webcomics inspired by them. We talk about Cthulhu and other old ones, extra-dimensional horrors, tentacles, forbidden knowledge, cultists…. fun times! Cover Art by: Robyn Seale. 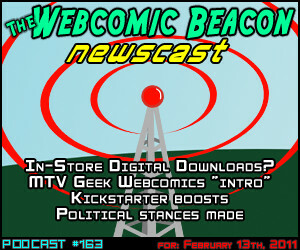 Eric, Mark Savary, and Fes run this edition of the Webcomic Beacon Newscast! We also have newshound Eric (Exiern) to thank for snooping out stories, who was also on today’s show! We were also joined by Zoë Robinson for announcing winners of the 2011 Webcomic List Awards. 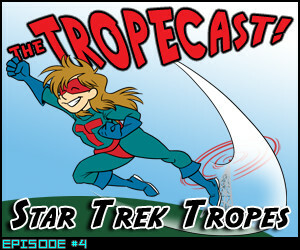 Fes, Tanya Higgins, and Mark Savary join forces with Rosscott, Adam Smithee, and Jules Rivera to discuss Star Trek Tropes! 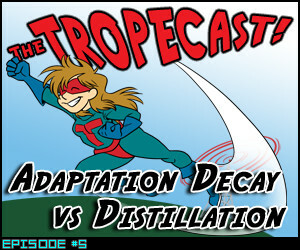 Yes, this episode of the Tropecast, nearly all of the Webcomic Beacon crew is on! (Alex is gone at a convention). Tanya does, sadly, bow out due technical difficulties. TV Tropes: Red Shirts, The Worf Effect, Explosive Instrumentation, Mary Sue, The Wesley, Growing the Beard, Mauve Shirt, Klingon Promotion, Dropped a Bridge on Him, Mirror Universe, Beard of Evil, Captain’s Log.